Selway - Bitterroot Addition/Rackcliff - Gedney Click on the image to enlarge and zoom. The 90,000 acres of Rackliff – Gedney Roadless Area are generally between the Lochsa and Selway Rivers from their confluence eastward to the Selway – Bitterroot Wilderness boundary. The ridgetop that separates the drainages is the boundary between the Nez Perce – Clearwater National Forests (before consolidation). This country is composed of picturesque mountain scenery: some ridges are weathered and smooth with scattered stands of trees among meadows flush with beargrass and wildflower blooms in a dizzying array of purple, pink, red, yellow, blue, and white. Other peaks are sharp and barren like the appropriately name Knife Edge Ridge. Elevation ranges from 1,500 – 1,900 feet at the river canyons to 6,926 feet at Coolwater Lookout, the highest point in the area. Past wildfires have impacted the vegetation today, evidenced by the extensive brushfields punctuated by islands of unburned trees and stands of relatively new growth. Comprising the blend are western red cedar, larch, Douglas fir, grand fir, ponderosa pine, and western white pine. At higher elevations one finds lodgepole pine, subalpine fir, Engelmann spruce, and scattered whitebark stands. Several sensitive plant species are present, including Payson’s milkvetch, lance-leaved milkwort, Northern moonwort, Constance’s bittercress, Pacific Dogwood, Daubenmire’s dasynotus, clustered lady’s-slipper, Evergreen kittentail, and bank monkeyflower. Such a vegetation pattern creates rich, bountiful forage for ungulates: elk, mule and whitetail deer, moose, and mountain goat fluctuate from high slopes in the summer to the river bottoms in the winter. Glover Ridge, a flat, open rim in the east sector, is a key favored elk-calving area. Rackliff – Gedney is also home to black bear, fisher, cougar, wolf, lynx, and has grizzly bear habitat along with the contiguous Selway – Bitterroot Wilderness. Furthermore, it supports a stunning array of bird species, including several varieties of woodpecker, sapsucker, and raptors like osprey and bald eagles. The area contains several streams on both the Lochsa and Selway sides of the divide that are crucial spawning and rearing habitat for anadromous and native fish. 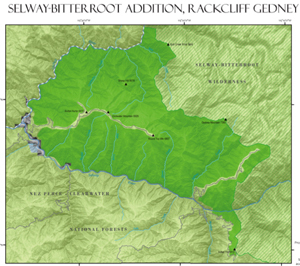 Topographically, Rackliff – Gedney presents an exciting challenge. Trails tend to lead the explorer upwards toward the ridge tops, traversing steep slopes and cliffs. The rewards for the arduous climb are stunning, matchless panoramic views, icy mountain lakes and cirque basins, brilliant wildflower blooms, and juicy berry patches. Not for just its scenic attributes is Rackliff – Gedney a special place. Approximately 100 acres of the Lochsa Research Natural Area are located here, and the roadless area as a whole is within the 5,600 acre designated Wild & Scenic River Corridor. 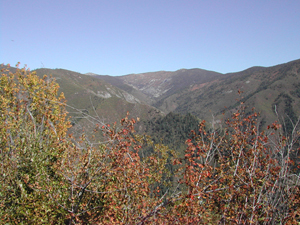 Native Americans used Coolwater Ridge, Knife Edge Ridge, and Ridgetop Trail 3A into the Wilderness, both prehistorically, and in historic times. Artifacts found suggest these peaks held a spiritual significance for indigenous peoples. The natural integrity of this region’s pivotal ecology, along with its spatial orientation, makes it an important candidate for inclusion in the Selway – Bitterroot Wilderness.